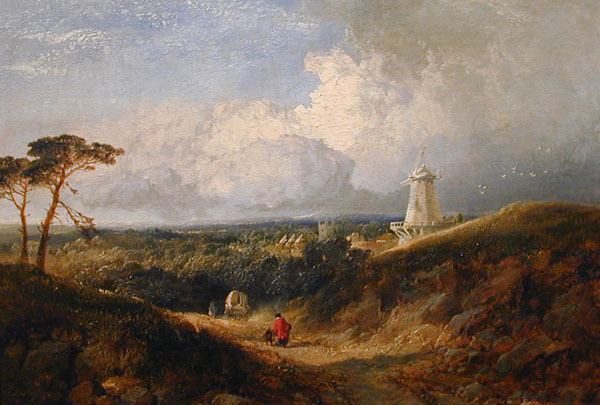 Summary: Oil painting showing a Kent landscape. There is a white windmill and oasthouses in the distance. Two figures are walking down a track. 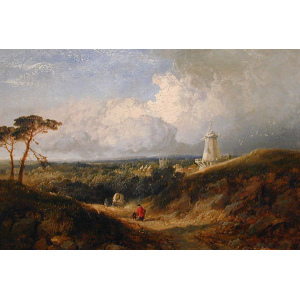 Description: The windmill, the flat open countryside and the oasthouses in the distance make this Kentish landscape easily identifiable. In the nineteenth century the picturesque market town of Cranbrook became home to a colony of artists who painted its houses and their inhabitants. They were pretty pictures of an idyllic way of life, full of nostalgia and were very popular with the wealthy industrialist collectors of the North. One such collector was Sidney Cartwright, a Wolverhampton tin-toy manufacturer and JP. He was an avid collector of the Cranbrook colony's work as well as other well-known artists of the time.